The San Diego Padres take on the Texas Rangers on Friday at Globe Life Park. The probable starters are Ian Kennedy for the Padres and Wandy Rodriguez for the Rangers. The opening line for this matchup has San Diego at +101 and Texas at -111. The over/under was set at 9. The Padres have a 48-35 over/under record and a 43-44 run line mark, meaning they cover 49% of the time. The Rangers have a 37-43 over/under record and a 51-34 run line mark, which means they are covering the spread 60% of the time. The Padres come into this game with a 39-48 record, and they are 21-26 away from home. Ian Kennedy has a 4-8 record on the season, an earned run average of 4.84 and a 1.31 WHIP. The Padres are 6-9 over his 80 innings pitched and he's also given up 82 hits over that time period. Against the over/under, the Padres are 8-7 in his starts. His teammates are averaging 4.2 runs a game when he pitches. The bullpen's earned run average is currently 3.79 and they've given up 243 hits on the season. Opposing teams are hitting .240 against the Padres bullpen while walking 94 times and striking out 243 times. San Diego is averaging 8.31 strikeouts per game while getting 8.68 hits per nine innings as a team. They rank 19th in baseball in team earned run average at 3.97. San Diego ranks 28th in the league in team batting average at .238 while hitting .238 on the road. Ranked at 29th in the league in on-base percentage, the Padres sit at .293 and they hold a .368 team slugging percentage. Matt Kemp leads the team in hits with 81 while the team ranks 27th in baseball with 8.13 hits per game. With a 41-44 overall record, Texas will come into this game 15-24 at home. Wandy Rodriguez has a record of 5-4 while sporting an earned run average of 4.23 on the year with a 1.49 WHIP. The Rangers have a record of 9-5 over the 78.2 innings he's pitched during which he's given up 86 hits. Against the over/under, the Rangers are 4-9 when he starts. His teammates score an average of 3.7 runs a game when he pitches. The bullpen's earned run average is currently at 4.33 and they have given up 268 hits on the season. Opposing teams are hitting .252 against the Rangers bullpen while walking 105 times and striking out 229 times. Texas is averaging 6.52 strikeouts per game while getting 9.12 hits per nine innings as a team. They rank 26th in the league in team earned run average at 4.24. They rank 22nd in the league in team batting average with a .248 average while hitting .263 at home. Ranked at 18th in the league in on-base percentage, the Rangers sit at .312 and they hold a .399 team slugging percentage. 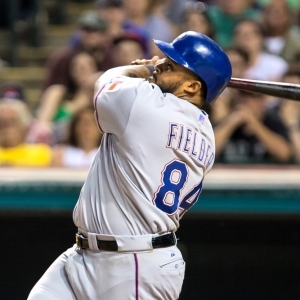 Prince Fielder leads the team in hits with 110 while the team ranks 18th in baseball with 8.46 hits a game. The Padres have committed 52 errors and have combined for 840 assists and 2,337 put outs leading to a .984 team fielding percentage. The Rangers have committed 66 errors on the season with 857 assists and 2,279 put outs leading to a team fielding percentage of .979 on the year.